Oh, how I love all the beautiful, fresh fruit that reaches its prime in summer! From the luscious strawberries that mark the start of the season, to the flavorful peaches and blackberries that make the heat of July and August a bit more bearable, I adore them all! As delicious as fresh fruit is on its own, these summer sweet gems lend themselves so nicely to being transformed into beautiful desserts! Here in the central valley of California, we are so privileged to live in the heart of farmland. Throughout the week, I have my choice of at least 6 different local farmer’s markets, just a few miles in any direction from my home. I love preparing a loose menu plan for the week, then allowing the fresh produce available to dictate my final decisions. 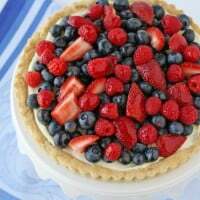 When it comes to desserts, I love recipes that can be easily adapted to include a variety of fresh fruit. 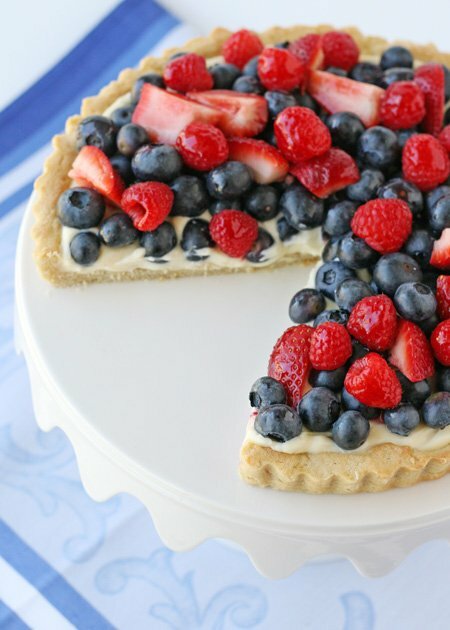 This simple fruit tart is a perfect base to show off beautiful summer fruit! The lightly sweet crust, and sweet and tangy filling are the perfect complement to a variety of fruit. This time I used strawberries, blueberries and raspberries. Other good choices would be blackberries, cherries, plums, and kiwi. 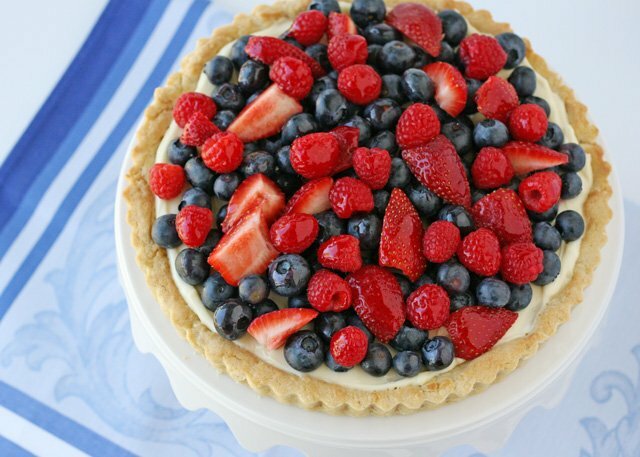 This tart includes a sweet, cookie-like crust, creamy lemon filing and can be topped with any assortment of fruit you like. Prepare the crust by mixing all the ingredients until a dough forms (using a mixer or food processor). Press dough as evenly as possible into an ungreased 10" tart pan. Place tart pan (with dough) in the freezer about 1o minutes. 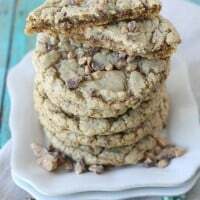 Remove from freezer, place on a baking sheet, and bake in a pre-heated 400*F oven for 10-12 minutes, or until light brown. Allow to cool. Beat the cream cheese with an electric mixer until smooth. Add lemon curd, and continue beating, until fully incorporated and smooth. Spread over cooled cookie crust, and refrigerate 1 hour (loosely covered) until filling is slightly firm. 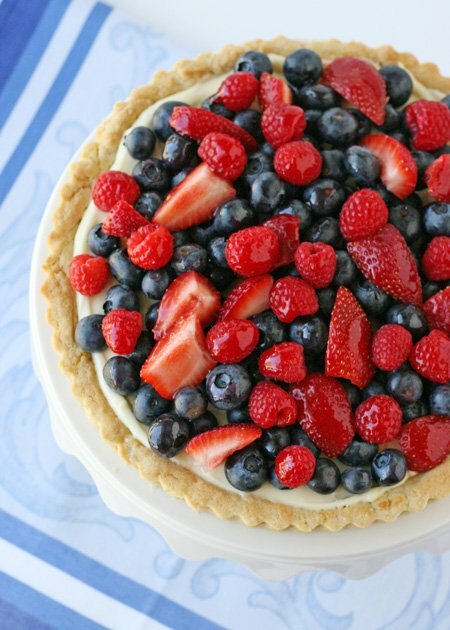 Arrange fresh berries or assorted summer fruits over lemon filling. If desired, brush fruit with warmed red currant, or apple jelly, for a shiny appearance. Serve immediately, or refrigerate until ready to serve (up to 4 hours). Disclosure- This post is part of the BlogHer Market Fresh Cooking series, which includes 100 percent editorial content presented by a participating sponsor. Our advertisers do not produce editorial content. This post is made possible by Hellman’s/Best Foods and BlogHer. Your cakes are so beautiful!!! Ah, it looks so delicious. I never done a cake, never done any kind of pastry but I am so much doing it. This looks absolutely delicious! I love all the colours and presentation of this tart! I have been craving fresh fruit like crazy..this looks amazing!!! Wish you were closer, I’d make one for you and bring it right over! This looks so good! And perfect for summer! This looks so yummy. I stumbled across you on BlogHer and actually work for the Calfiornia Strawberry Commission and would love to share with our FB fans if that’s ok with you! Yes, please feel free to share! I LOVE California strawberries! Sweet tarts are my favourite thing to cook and eat – I love the addition of fruits too, what beautiful colours! This looks absolutely delicious! 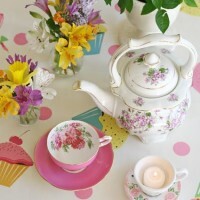 I have a dinner party in about two weeks and this just might be the answer to my sweet prayers! 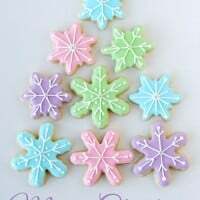 That looks so pretty…and yummy, too! I have seen many tarts around the blogs lately but few as pretty as yours. I love the sound of the lemon curd in the filling. This is just beautiful, beautiful!! WOW!!! Great recipe…!!! I’m agree with you, recipes that can be easily adapted are the best when it’s about fruits, as we don’t have all fruit all the time. What I like from this recipe is that you are using Lemon Curd, it happens time to time that I have a lot of yolk because I made things with egg whites, and I’m always looking to use them. Made this for my birthday this weekend. 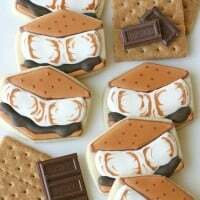 Easy to make make, and it looks amazing. Everyone loved it. Thank you for another wonderful recipe! I made this today for my daughter’s 22 birthday. She does not like traditional cake so this is perfect. I used blueberries strawberries and raspberries recipe is exact. thank you!! Delicious!